Lyndsay Williams Blog : Why no audio on the SenseCam? Many people ask why there is no audio on the Sensecam when I invented it for Microsoft? It can be done, one, it is easy to use a standard digital audio recorder (e.g. 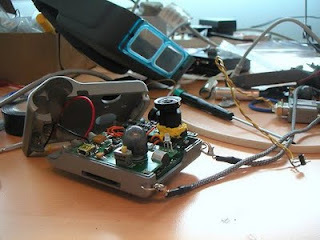 maybe the new Apple ipod nano) to record audio with time synchronised information to sensecam video. Two, my concerns over privacy issues, conversation is likely to be inhibited if you know audio is being recorded. Some people just dry up and you never hear their best (or worst) jokes! Third, I did design an audio compression algorithm for Sensecam. This uses snippets of sound bytes from the day, e.g. train sound, London Underground, car engine sounds, laughter, footsteps, kettle sound etc to add an atmosphere of sound, and adventure to the video. It did not record conversation. The video stills are playing back at about 100 times faster than the days' events so the audio needs to keep up. I was developing this when I was deleted from Microsoft, and the work never got patented. It was based on detecting sounds over a preset amplitude and an FFT filter to pick out interesting sounds of artefacts. There was a microphone in early version of sensecams, see it in image, by the strap. The iPod nano allows users to capture audio as here The Nano also captures video as well. It is interesting to note synchronised music can be added to SenseCam videos, here are some. on my patent sold to them re iPhone sensor technology as here.